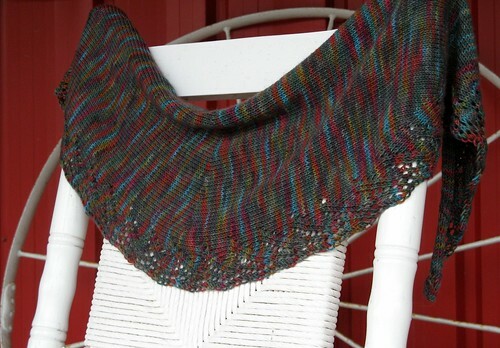 Introducing my latest pattern: the Babylon Shawlette! Knit from a single skein of sock yarn, this shawlette started out life destined to be a pair of socks … but the yarn wanted more. In sock form, the colors pooled and flashed in an unacceptably foul manner. No matter what I did, the yarn would not cooperate. 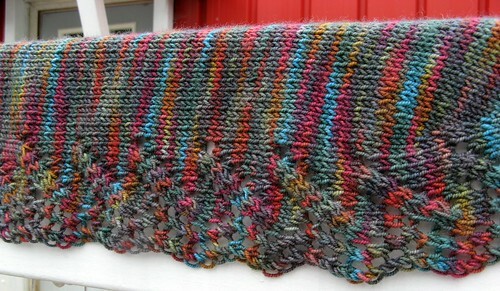 Design/Skills Needed: This sinuous shawlette is designed to show off unusual colorways while fighting pooling and flashing with a varying-width edging and tapered ends. 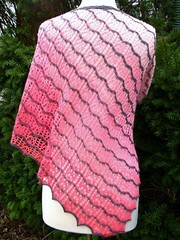 Short rows at the center back curve the shawlette into a shoulder-hugging crescent and add interest to the pattern. 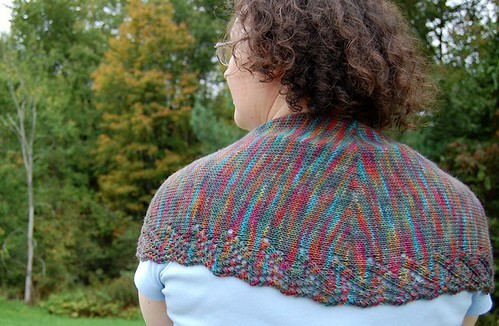 Babylon is worked from tip to tip in one piece — no finishing or picking up stitches! The neck edge has a worked-as-you-go i-cord border for comfort at prevent too much curling. The trickiest bit of the edging is the yarn-over at the beginning of each wrong-side row. It’s important to wrap the yarn the same way you would to do a normal stitch–that way, it stays open and creates a pretty loopy edge. The extra effort is worth it: a pretty edge that doesn’t roll and isn’t garter stitch, yay!